I am blown away that January is already almost over! If you're like most people, January is a time for reevaluating your life, setting goals, making plans, and getting organized. That's exactly what's been happening around here this month! 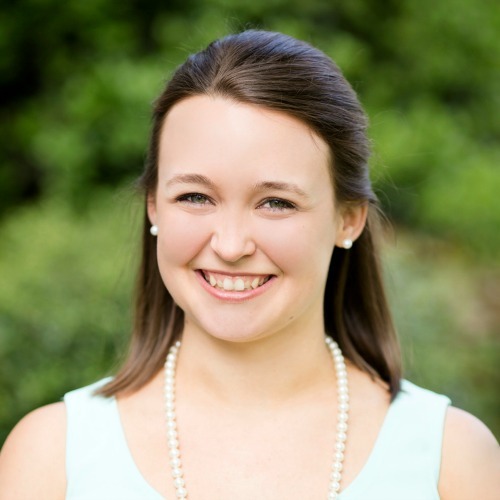 I had a big chat with my husband, and then an even bigger chat with some of my closest friends, about how I want to simplify my life and feel more organized and less overwhelmed. After lots of brainstorming, I came up with five ways that I am going to get more organized this year. It's only January, but so far these are all working out great! With a little encouragement from the people in my life, hopefully I can keep it up and achieve a more simplified, happier life where I can focus on the joyful things in life instead of letting the stressful things pile up! In the past six months or so, I've been overwhelmed by the amount of stuff we own. I've got a basement full of boxes that I haven't opened since we moved into this house four years ago. I have a garage full of materials I might need one day leftover from various projects. And now that we have a one year old and another baby on the way, I have toys, books, baby clothes, and baby supplies that I can't find places to put. I also have a closet full of clothes that I haven't worn in years just because they might come back in style some day. TOO MUCH STUFF! When it gets to the point that even the stuff hiding behind closed doors is constantly looming over your shoulder, it's time to do something about it! This year, it has become very apparent I need to declutter and simplify my life. I recently started reading the Kon Mari books (The Life Changing Magic of Tidying Up and Spark Joy). Although I probably won't be quite as aggressive as she is in her methods, I can already see the positive outcomes of her life changing system. We have been discarding, donating, and recycling left and right, and let me tell you, it feels SO good! As we slowly make our way through purging the house, we need to sort and organize things. One of the things that the Kon Mari method stresses is that you can't find a permanent place to store things until you are completely done purging, otherwise all you are doing is moving things around your house. I totally agree as I have definitely caught myself moving less used items from one closet to another instead of just getting rid of it. So, my temporary solution until I finish purging and can truly find an efficient storage system is to put things in clear plastic bins. This way I can see the contents easily and can put similar objects together. They also come in handy for storing all of the baby clothes we have accumulated (although I am getting rid of plenty of my own clothes, I plan to hang on to baby clothes until we're done having kids since they outgrow them so quickly and can be handed down!). The only bad thing is that storage bins can be quite expensive!!! Thankfully, this year I found the best way to save money on storage bins! 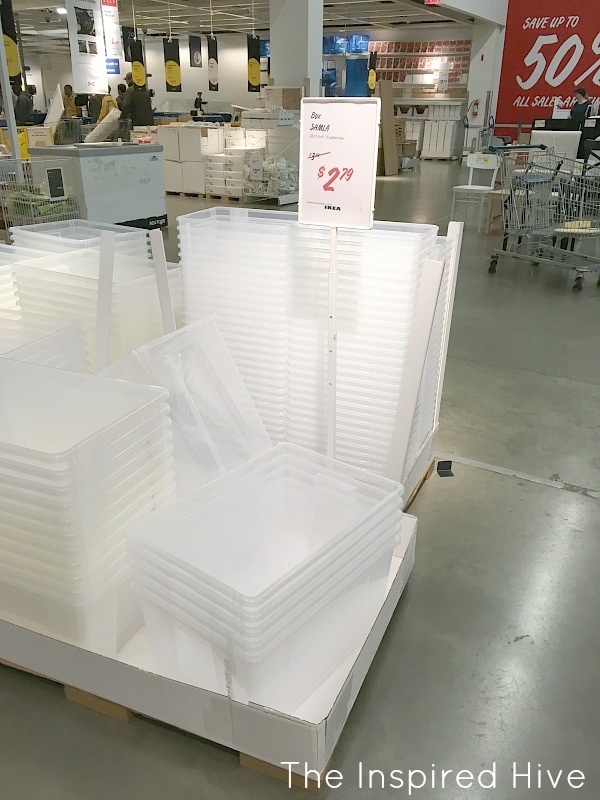 Did you know that Ikea has a huge storage sale at the beginning of January?! You better believe I sprinted over there as fast as I could and snagged as many bins as possible! I am officially heading to Ikea every January from now on! If you're anything like me, you love a clean house, but struggle to keep up with it sometimes! Between all of the other obligations we have in life, sometimes cleaning falls to the bottom of our priority list, and before we know it the house is a wreck, dusty, and dirty. Then, I spiral into this completely overwhelmed state where I feel pressured to clean the whole house in one day but don't even know where to start! Ugh! So I'm trialing something new. I bought a dry erase board, stuck it on the fridge, and put a very simple cleaning schedule on it. I broke it down into which rooms would be cleaned each day, as well as which small tasky things I wanted to be done every day (dishes, anyone?). This has really helped me break things down into smaller chunks that I can get done quickly, because really, if it's just one room, all I need is fifteen minutes, not a whole day. That's totally manageable during nap time! It has also helped my husband pitch in a little more, because he knows exactly what I want to get done each day. I've been really blessed with a not-so-messy husband, but he's still a man (no offense to any guys reading! ), and sometimes they just don't see the mess if you don't specifically say this is what needs to be done today ;) So far, this system is working well for us, and I hope we can keep up the habit! As our family grows, so does our schedule. I have to balance my work schedule, blog schedule, doctor's appointments, play dates, social life, and to do list somehow. I've always been a paper planner kind of girl... I can't do digital calendars. There's something about putting pen to paper that just clears my head. However, last year I was carrying around two planners, one for every day life and one for blogging. In addition, I was making a weekly meal plan separately, and a to do list. My system was complicated and confusing. I've always been a pretty organized and task oriented person, but adding another little person to the mix completely threw off my Type A personality last year. I reevaluated my system and realized I needed to try to keep my schedule all in one place. I did some research and looked for a planner that could encompass all aspects of my life. I ended up deciding on The Everyday Planner from Nina Hendrick. I love that I can print it out myself and that it has an option for a blogger edition. It even has space for my weekly meal plan. It's easy to organize it in a way that works for me. I ended up buying this planner to put it in, these expansion rings (because I overflowed the original size rings... oopsy! ), and this special discbound hole punch. I love that I will be able to use the binder again next year and that I can even add my own pages to it since I have my own hole punch. 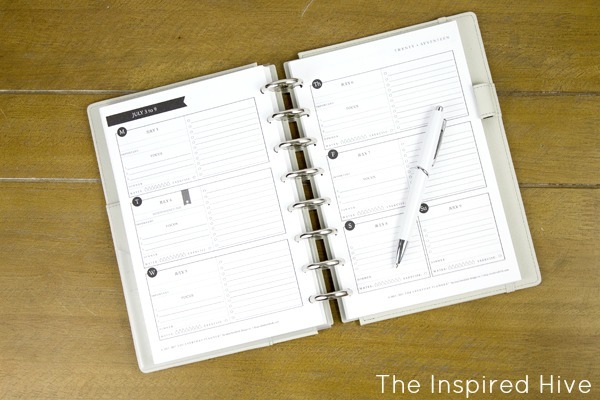 The printable planner comes in a full size and a junior size, so some pages (mostly blog related) that I only need on a monthly basis I printed in the large size to put in a binder in my desk, and things that I use daily or weekly go in the small planner which I can easily tuck in my purse each day. I am officially in love with this planner!!! If you couldn't tell from the section above, I am a list maker by nature. I love writing things down and am especially productive when I can check things off of a list. But again, I need that pen to paper feel to help me clear my head. Although I have the planner that I carry around with me, I also like to leave a list for the week out in a visible place so that I don't forget anything (or so my husband can peek at it and see what he might be able to help with). I've had a pretty good all encompassing list system for the past couple of years and recently realized I should turn it into a pretty worksheet version I can print out instead of creating a new one on loose leaf notebook paper each week. 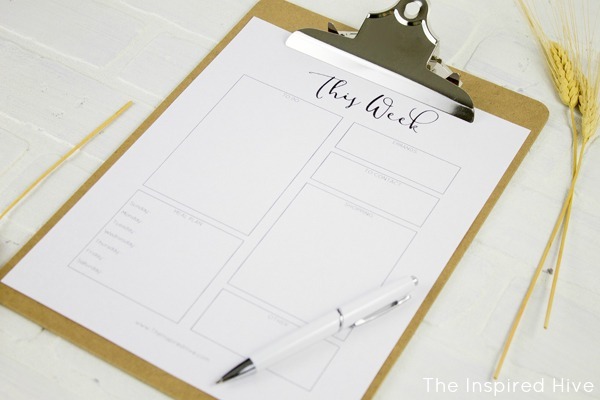 Well, I've also decided to share that weekly to do list with you! It's broken down into tasks, meals, errands, people I need to contact (phone calls, emails), shopping list (I put my grocery list and any DIY supplies here), and "other" which I use for any important blog tasks for the week, but you could use it for any important reminders or perhaps your cleaning schedule. I've been printing out a few copies at a time and keeping them on a clipboard on my desk or kitchen counter. It's so helpful to have everything for the week all in one place and easily accessible. To download your copy, click the link below and sign up for my email list. Once you have confirmed your subscription, you'll get a link to the download in your inbox! Be sure to save the email as a trusted sender so that future messages don't end up in your spam box! I stumbled across this awesome bundle of courses, ebooks, and printable planners to get you started on your organizing and decluttering journey! The Conquer Your Clutter Super Bundle is $47 and is jam packed with useful info and awesome printables created by some of my favorite bloggers. 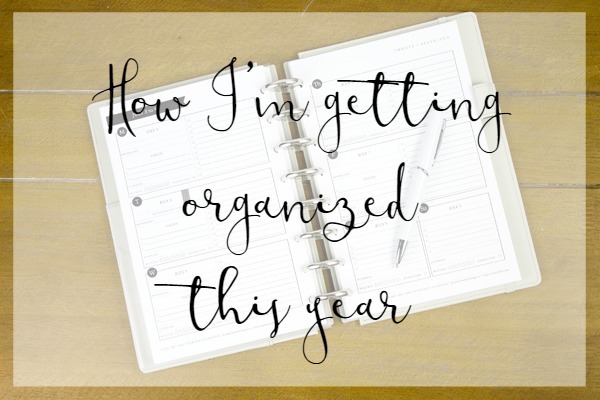 I would love to hear how you're getting organized this year and what strategies work best for you! Have a great tip? Share it in the comments below! 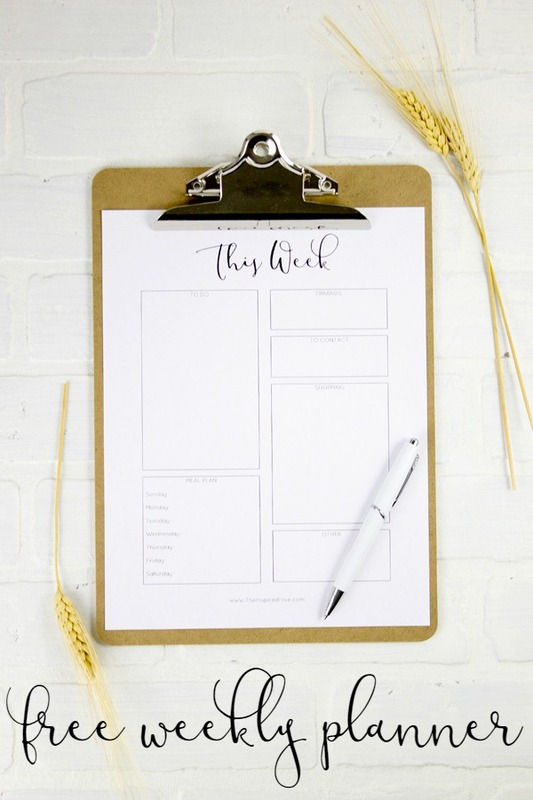 Get your FREE printable weekly to do list!